Deuteronomy brings us to the feet of one of history’s greatest teachers. The Israelites were about to enter an unknown land that had a culture radically different from their own. Moses equipped them with God’s truth so they could move forward without fear. Today we can also find courage and direction in Moses’s words as we learn how to use the lessons of the past, why God’s law is the best foundation, and what it means to share in God’s covenant. The Wiersbe Bible Study Series delivers practical, in-depth guides to selected books of the Bible. Featuring insights from Dr. Warren W. Wiersbe’s Be Equipped commentary, this eight-week study includes engaging questions and practical applications that will help you connect God’s Word with your life. Wiersbe Bible Study Series: Deuteronomy by Warren W Wiersbe was published by David C Cook Publishing Company in July 2015 and is our 40937th best seller. 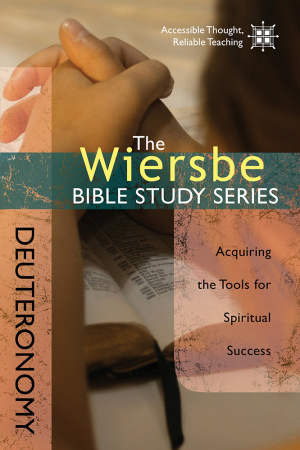 The ISBN for Wiersbe Bible Study Series: Deuteronomy is 9780781410410. Be the first to review Wiersbe Bible Study Series: Deuteronomy! Got a question? No problem! Just click here to ask us about Wiersbe Bible Study Series: Deuteronomy.